The Tour Divide, one of the toughest mountain bike races on the planet, gets underway on Friday when riders set out from Banff, Canada and begin heading south along the Great Divide Mountain Bike Route. Over the next few weeks, they'll cover 4418km (2745 miles) eventually ending in Antelope Wells, New Mexico in the U.S. Along the way they'll face unpredictable weather, remote trails and demanding physical and mental conditions, just to finish the race. In recent years the Tour Divide has earned itself a reputation for being a very challenging, yet satisfying, event that has stayed true to the roots of mountain biking. The riders are self-supported, must navigate their own route and possess an adventurous spirit that will serve them well as they ride the longest off-pavement cycling route in the world. 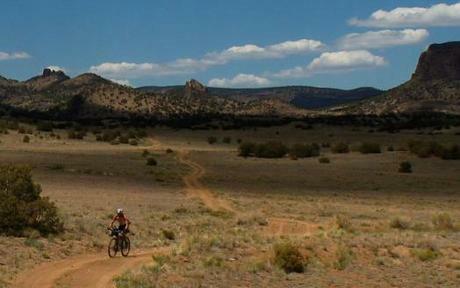 That route is mostly unmarked and varies from narrow single-track to dirt roads and jeep tracks. It passes through Alberta and British Columbia in Canada, before crossing into the United States where it winds across Montana, Idaho, Wyoming, Colorado and New Mexico. Some of the faster riders will actually finish the race in under 20 days, although most will take more than that. It is not uncommon to have half the field scratch either, as the race is very demanding on both the rider and the bike. In the past, the weather has also made things tough, as unexpected late-season snows made the route very challenging last year. Good luck to all the riders as they get underway. Hopefully it will be easier to follow progress as the race unfolds this year, as that hasn't always been the case in the past.